Loved the book. Found the characters believable, real; the situations believable real; the character responses (to life) believable, real. Ms Lahain has a way of writing that puts you right into the story. One can relate to career, family, life situations (functional and nonfunctional) that her characters face. What a nicely balanced novel this is. And it's the balance that makes it so pleasurable to read.The characters are not divided up into just those that are good and those that are bad. The positive ones still have realistic negative characteristics (for instance, responsibility is usually a plus but, in protagonist Molly, there's quite a bit too much, and that's what gets her into trouble). The more negative characters still have some positive sides. For all Antonio's foolishness, I found myself wanting to. . . well, let's just say I understood why Molly had married him. Because the characters all had flaws and all had their positive attributes, I felt myself being able to relate to them much more.There is some beautiful description, but not so much that it gets overwhelming. . . just enough so you can really see the characters in action. There is just enough tension and suspense. Will he. . . will she. . . will they? I don't even want to say too much because the fun is in reading it for yourself. There is humor, realistic and true to life, generally in bits of dialogue, coming only when it is appropriate to the character and situation. There is all the food that is mentioned in detail. Especially desserts. All I can say is don't read this book when you are hungry.Finally, I think the novel has excellent pacing. Somehow, it reminds me of a horse I used to ride. Ace was an older quarter horse; his days of bursts of speed were long passed. But he still liked to canter (especially when we were headed back to the barn). I'd never been on a horse with such a smooth and relaxed canter. Or such a slow one. He was such a pleasure to ride in part because, as he cantered, I was still able to look around and see a rabbit on the side of the trail or a flower that had just, in the last day, bloomed. The speed of Knife Skills is like Ace's canter. You don't get caught up in unnecessary detail or endless description or dialogue. Nor does everything whir past in a blur. Instead, you just find yourself going along with the flow, eagerly awaiting the next line as you turn the page. This is not a cookery book!This is a book that serves up a tasty variety of characters with a plot that is a modern reworking of Mansfield Park. The setting is Long Island, on Molly’s uncle’s vineyard, and this in itself was a fascinating aspect of the book for me. Wide open spaces, dirt tracks, distances between towns... there is a skilfully evocative handling of place that makes this book smell good. And a similar exquisite intensity bubbles up in the characters, too. Lahain is a master of subtlety. The reader often feels what is not said, more than the words that are spoken.Molly is adopted, we know this almost from the beginning, but with time and insights, which come in layers, we really feel it. Her story is a complex one. She is torn between a mother who deserted her and a family who took her in, a disastrous marriage and a deliciously romantic attachment. Molly tries to find her own place in the world through her ambition to become a chef who can cook to perfection. Lahain obviously has experience in food preparation - there is little the reader can do to avoid the torture of the mouthwatering dishes Molly prepares.The writing is, of course, top notch. The plot is satisfying, avoiding cliché or sentimentality. Molly is a strong protagonist, who will not settle for second best!I have also read Lahain’s ‘The Ways of Mud and Bone’, which is another exceptional read.Highly recommended. 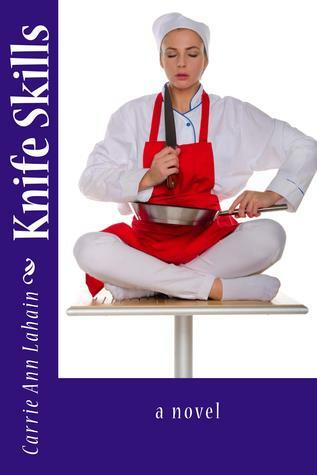 Knife Skills is a perfectly paced novel about a young woman, Molly, who is making a new life for herself after a recent divorce. At the start of the novel, Molly is in her final semester of culinary school, along with her roommate Lynne. The two plan to relocate after graduation to Long Island, where they’ll help Molly’s aunt and uncle open a restaurant on their vineyard. We learn that the vineyard is where Molly was raised by her aunt and uncle for the second half of her childhood, and that Molly has long been estranged from her parents. This book is difficult to put down, both because of Lahain’s wonderfully evocative prose and because we care about her cast of characters. There are complex family dynamics here, along with heartbreak, romance, and suspense. Much of the suspense is thanks to an ex-husband who has dangerous enemies and refuses to go away, but there’s also the lively and often humorous drama of the kitchen. Lahain writes these scenes so well, and her descriptions of food preparation and the mouth-watering results are so skillful, it’s obvious she has a great deal of experience in a culinary setting. Lucky for us! I was unable to finish this book because it just wasn't my sort of thing - I think it was too American for me. Not that I have any problem with American books, but this had so many points of reference that I just couldn't connect with. I realise this it's ME, not the book, and it's often just such a delicate thing, whether you connect with a book or not.I've given it 4* on here just the same, though, because I could see that it's really well written, so much that I shall go on to put another of Ms Lahain's books on my to-read list instead. I was disappointed not to have got into it; I did give it a couple of goes.I know 3* would have been sufficient on here, as it means 'I like it', but many people treat the Goodreads star system the same as the Amazon one, and on there 3* means 'it was okay' ~ and I'd say the way this was written makes it more than 'okay'.